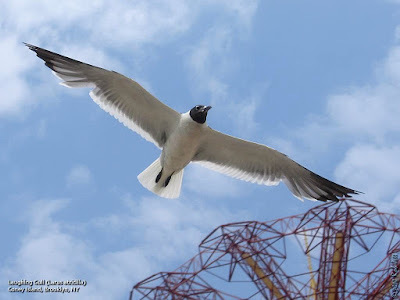 Humans aren't the only creatures that flock to Coney Island during the Dog Days of Summer. Laughing Gulls, which breed along NYC's coastlines, have adapted well to the urban environment. At the beach, they can frequently be seen stealing unguarded food or bathing and drinking at kiddie park sprinklers. "American Bird Conservancy (ABC) and its partners are pleased to introduce the Conservation Birding web site that allows birders to find lodges that contribute to bird conservation in the Americas. Each reserve that has a web page on this site has been designed to support the long-term protection of habitat for rare birds, with direct support from ABC, and is run by a local conservation group. When you visit, you know that the fees you pay contribute directly to the management of vital bird habitat." Just another way to help protect what we love. 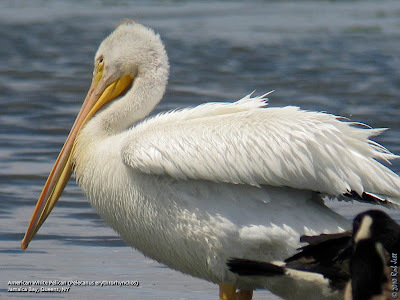 The observation of a second American White Pelican at Jamaica Bay was while I was with Benjamin, Keith, Rich and others from the New York State Young Birders Club. The NYSYBC is a great organization that I wish existed when I was young. Check out their website. Debbie Becker leads a free bird walk at the Garden every Saturday from 11 a.m. to 12:30 p.m. beginning at the Reflecting Pool in the Leon Levy Visitor Center. Join the Urban Park Rangers for early morning birding. Investigate what living things call a log home. Greetings. This is the New York Rare Bird Alert for Saturday, July 24th 2010 at 11am. The highlights of today's tape are AMERICAN WHITE PELICAN, WHIMBREL, HUDSONIAN GODWIT and WILSON'S PHALAROPE. Yesterday over 3 thousand shorebirds of about 16 species were counted at the East Pond at Jamaica Bay Wildlife Refuge including 1 HUDSONIAN GODWIT, a WILSON'S PHALAROPE, 9 LONG-BILLED DOWITCHERS, about 1,700 each of SHORT-BILLED DOWITCHER and SEMIPALMATED SANDPIPER. The AMERICAN WHITE PELICAN was still present yesterday at the East Pond. Six WHIMBRELS were reported last week, 3 at Nassau Point Park at Southold on Friday, 1 at the mussel flats near the Ponquogue Bridge at Shinnecock on Tuesday and 2 birds at Cupsogue County Park on Tuesday. 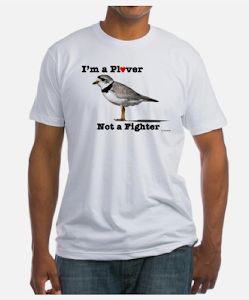 Also at Nassau Point yesterday was a flagged PIPING PLOVER reportedly tagged in the Bahamas. 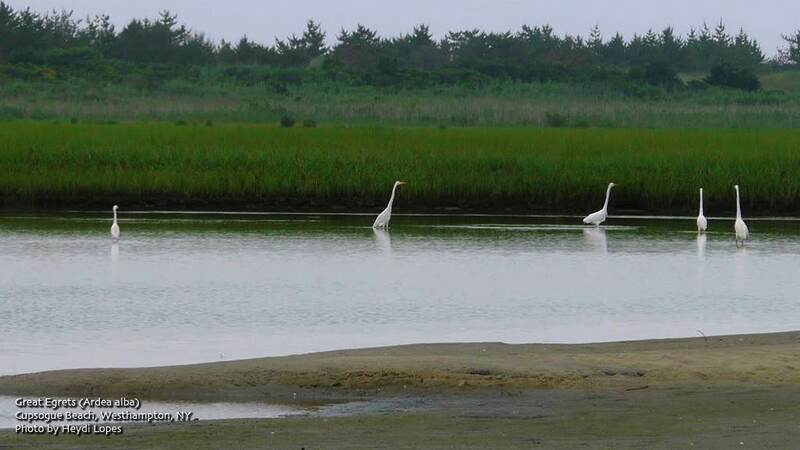 Other interesting reports last week included a YELLOW-CROWNED NIGHT-HERON along Dune Road at Quogue on Tuesday, a GULL-BILLED TERN at the Coast Guard Station at Jones Beach on Thursday, another GULL-BILLED TERN at Jamaica Bay Wildlife Refuge on Tuesday along with BLACK TERN. 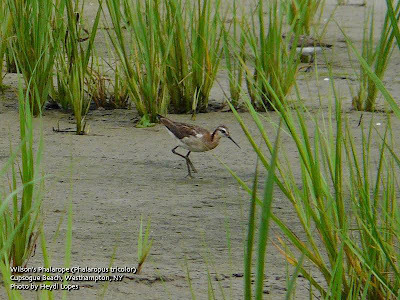 Two WHITE-RUMPED SANDPIPERS were at the East Pond at Jamaica Bay Wildlife Refuge on Tuesday. Tom Burke will be away next week. Please call in reports to Tony Lauro at (631) 734-4126. 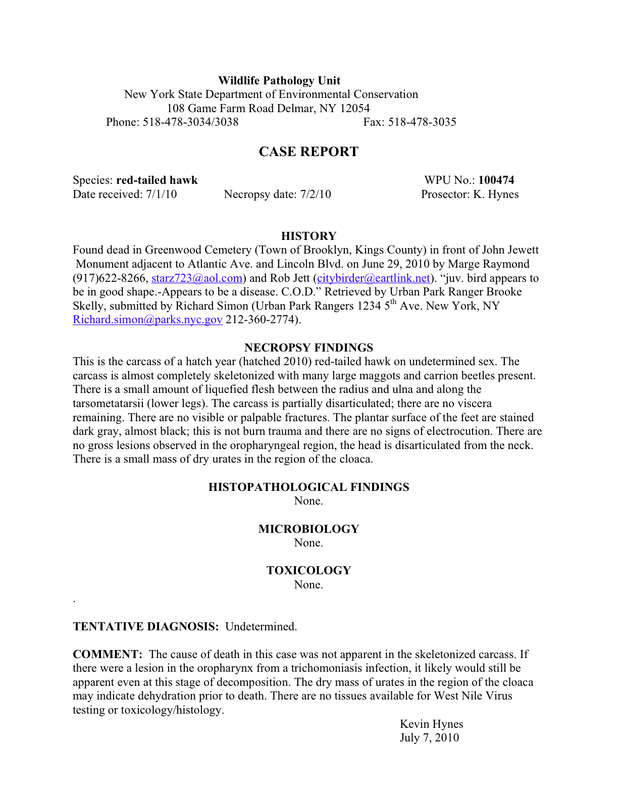 I received a copy of the necropsy report from the New York State Department of Environmental Conservation for the Green-Wood juvenile red-tail. Between last month and this month, New York City has had 20 days of 90 degree or hotter temperatures. The stifling conditions have made cycling very difficult, so my birding-by-bike mileage this summer has been a lot less than normal. I've had to rely more on public transportation. Last Friday I joined Sean, Chuck and Heydi for a welcomed birding road trip out to the south shore of Long Island for a seabird watch and to look for shorebirds and terns. Doug would be meeting us out there. 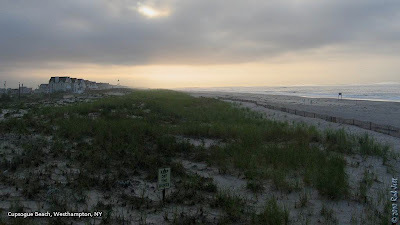 After a 4:30am pick-up time, we'd be heading to Cupsogue Beach County Park, which is about 65 miles (as the crow flies) east of Brooklyn. 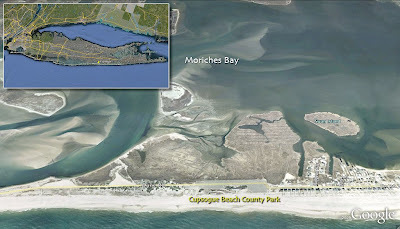 It is located on one of the narrow barrier islands that run parallel to, and protect, the south shore of Long Island. Cupsogue is at the western edge of the town of Westhampton, which is accessed via one of two bridges from the mainland. Seabirds, which are normally only seen from fishing boats from far offshore, can sometimes be seen from shore here. The main attraction, however, are the mudflats and sand spits on the bay side of the parking lot. 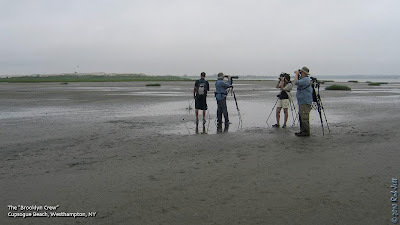 At this time of year it is not unusual to observe thousands of shorebirds and terns on the low-tide flats. Much of the area is submerged at high-tide, so one must time birdwatching trips to this spot carefully (or be able to swim a few 100 yards while carrying one's gear). We arrived at the beach parking lot at around 6:30am. Doug was already at the small boardwalk scanning the ocean. He reported that he had seen a few Great Shearwaters and some Wilson's Storm-Petrels. Chuck, Heydi, Sean and I quickly set up our scopes and began scanning the water. The sky was overcast and there was a fair amount of haze on the horizon, and it was considerably cooler than the near 100 degree temperatures that were forecast for the city. We spend about an hour chasing down seabirds that passed back and forth along the ocean. By the time we decided to put on our water shoes and trudge across the mudflats to look for shorebirds along the bay we had tallied Greater Shearwater, Wilson's Storm-Petrel, Northern Gannet, Laughing Gull, Ring-billed Gull, Herring Gull, Great Black-backed Gull, Least Tern, Black Tern and Common Tern. There is one trail at the north end of the parking lot that threads through a wall of phragmites, bayberry, poison ivy and other marsh plants. The relatively hard-packed surface gradually transitions to patches of mud, lots more mud, then a full blown slippery mudflat. Most humans avoid this kind of terrain, but it is a perfect spot to find waterfowl, assorted shorebirds, wadding birds, terns, Ospreys and marsh sparrows. Mosquitoes and deer flies are just an added bonus. We made it through the muck and to the sandbar with only one muddy casualty. From that location we could scan extensive stretches of marsh grass to the east and south, open flats to the north and flats with scattered patches of grass to the west. We stood at the aural epicenter of thousands of whistling, peeping, crying, screeching, trilling, kekking and croaking birds. I'd take that type of noise over a busy Manhattan street any day. The wide channel to the east of our location was dominated by Great and Snowy Egrets. Dowitchers probed for food in the shallower water. We also spotted a few Clapper Rails nervously scurrying along at the edge of the grass. One brazen rail ran across a wide opening near the northern edge of the flats. At one point a helicopter began flying very low over the marsh, spraying for insects. While it remained downwind from us, it effectively flushed every bird in the area. I counted five Clapper Rails skittering low across the grass, just below the helicopter's skids. All the shorebirds, skimmers and other terns concentrated in close flocks to the west of us. As we walked towards the flocks Sean spotted this very nervous Seaside Sparrow hunkered down behind a small clump of grass. We had been scanning small flocks of Least and Semipalmated Sandpipers to our west when Heydi asked about an odd-looking shorebird that was close to use. 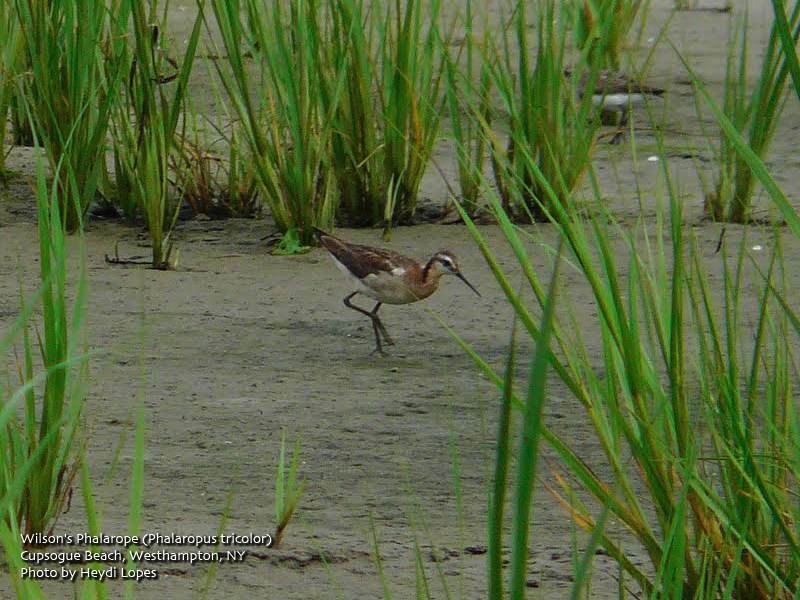 Everyone was pleasantly surprised to see that it was actually a Wilson's Phalarope. I'm used to seeing these unusual shorebirds spinning in circles in shallow water (see this post), but this individual was running around like a drunken sailor, snatching up insects from the surface of the sand. There were lots of Common Terns that we scanned and re-scanned, hoping to find something more unusual. Eventually, Doug pointed out a Roseate Tern, then Sean spotted a single Black Tern sitting on the sand. Earlier, Dave K. had called to give us a heads up on a Hudsonian Godwit far to the west. We all got mediocre, distant looks but, as the morning progressed, the large shorebird cooperatively flew much closer to us. 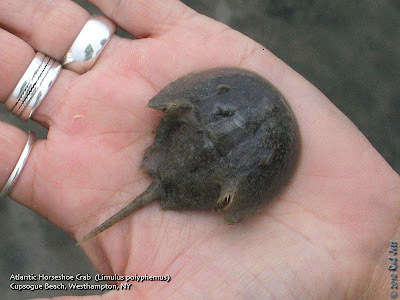 As the tide started coming up and water began flowing over the sandspit, I started noticing tiny, hatchling horseshoe crabs swimming around. Many measured only a few inches across, but some were even as small as the width of a quarter. It was reassuring to see that, despite ravenous migrating shorebirds and gulls devouring uncountable amounts of horseshoe crab eggs, quite a few had survived in this area. By 10:15am, I reminded everyone that we didn't have a boat, so that we should start heading back to the parking lot. The main channel that had only been up to my shins on the way out, was now up to my mid-thigh. The deeper water on the largest mudflat actually made walking a little bit easier. We all survived without an impromptu mud bath. In all, it was a fantastic day of birding along the south shore. We ended up with 62 species of birds, several of which were new for me for the year. It was also a great way to spend my birthday. This American White Pelican was discovered hanging around the Jamaica Bay Wildlife Refuge since July 14th. They aren't normally found in New York State as their breeding range is the northern great plains and western mountains. Winter range is along the southern coasts. 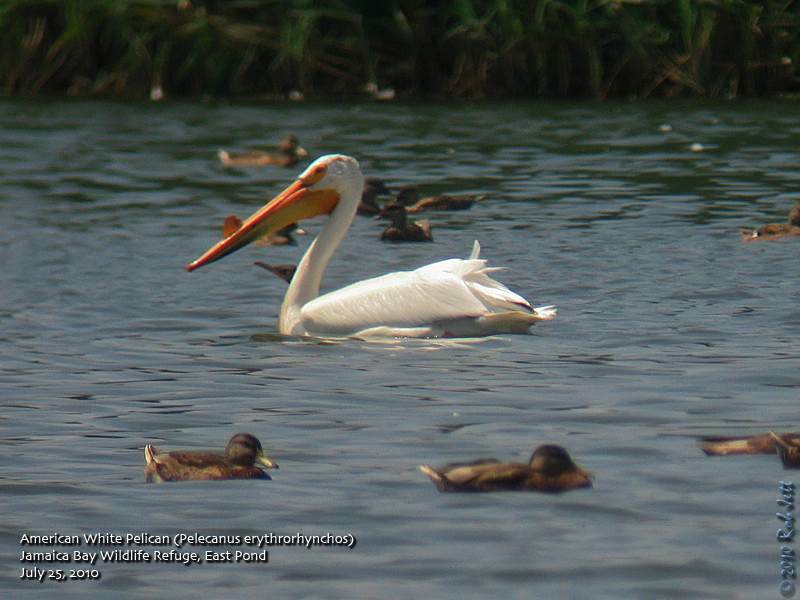 It is probably the only pelican that can be seen from a subway train. Here's a map of the location. Dendroica is an interactive website developed to help students, volunteers and professionals improve their skills at identifying birds by sight or by sound, particularly so that they can participate in nature survey and monitoring programs. The site includes birds from throughout Canada, USA, and Mexico. Participants can contribute new photographs and sound recordings so it will continue to improve over time. Dendroica allows you to browse through lists of species found in a particular region to see their pictures and listen to their songs and calls. You can then quiz yourself, based on songs or photos or both, to see how well you have learned the species. You can develop your own custom list of species for study. I briefly browsed through the site and found the interface easy to use with lots of great information. I recommend checking it out. Sorry for the lack of postings. I took some time off earlier in the month and am trying to catch up. Here's a brief update on the juvenile Red-tailed Hawks in Green-Wood Cemetery. I've been back to Green-Wood Cemetery three times since Bobby released the juvenile Red-tailed Hawk that had been injured. While I've been able to locate the "original" juvenile from the cemetery's nest, I haven't had any luck finding the foster child. Summer sounds around the cemetery are now dominated by cicadas, mockingbirds and robin alert calls. There are also small pockets of House Wrens and Chipping Sparrows. I spotted several fledgling chippings in the short grass being fed by their parents. Bobby, the head of security, reported to Marge that he saw the banded young Red-tailed Hawk near the Dell Water. That area is about 1/2 mile southwest of where he was released and at the opposite side of the cemetery. My search for the banded hawk would be concentrated in the area below the nest (Hill of Graves), the Dell Water and the route in between. The young female hawk was easy to find each time I went looking. She still spends most of her time near the Hill of Graves and her nest tree. She also still whines a lot for free handouts from Junior and Big Mama. There has also been a male and female kestrel hanging around the hill just to the west of the nest tree. Trying to find the hawk within the cemetery's nearly 500 acres is like looking for the proverbial needle, but other birds make it a little easier. Robins are the most vocal warning system when a predator is present. Mockingbirds make less noise, but actively attack the source of danger. Blue Jays are just generally noisy birds, but will sometimes actually locate a hawk. I spent a lot of time just walking slowly and listening for the alert calls of these birds. During one outing the robins lead me to Junior, who was sitting in a maple tree near the Pierrepont family memorial eating an American Woodcock. I'm not sure if woodcocks breed in the cemetery or this was just an unfortunate migrant passing through. The last time I went searching for the missing red-tail I headed directly to the Dell Water. There were no signs of the hawk at that location, but as I was leaving, heard several jays calling incessantly from the ridge behind William Niblo's elaborate Gothic Revival tomb. I followed the sound until I found three Blue Jays and a single robin screaming their warnings about an unseen predator. Their attention seemed to be focused on a large Japanese Cedar (Cryptomeria japonica), but no matter how many times I walked around the tree, I could not see any hawks. Finally, I decided to clap my hands, hoping to flush whoever it was that was upsetting the songbirds. It worked, but to my surprise, it wasn't a Red-tailed Hawk, but an adult Cooper's Hawk that flew from the cedar. As the large songbird predator took off, she stayed low to the ground and stuck wove in and out of dense stands of trees. Meet at 9th St. & Prospect Park West (near F Train station at 7th Avenue & 9th St.) at 7:45 p.m.
A beginner's tour of Jamaica Bay given by Sebago Canoe Club members in Paerdegat Basin, Brooklyn. In partnership with Gateway National Recreation Area Meet at the Jamaica Bay Wildlife Refuge Visitor Center. Hike around the ponds and gardens during shorebird migration. Limited to 35. For more information or to register, contact Don Riepe at 718-318-9344 or driepe@nyc.rr.com. 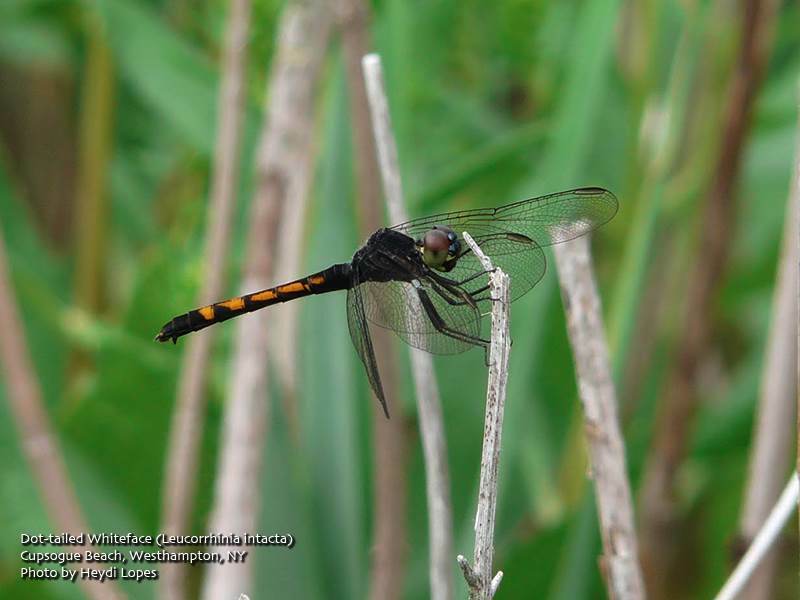 Saturday, July 24, 11 a.m. to 1 p.m.
We will look for evidence of animal life, especially deer, raccoons and other mammals in the summer woodlands surrounding Long Pond. We’ll also look for the bird life, examine the geology of the area and observe evidence of past human use of the area during the unhurried stroll through about one and a half miles of the park. Meet at P.S. 6, on Page Avenue and Academy Avenue about three blocks NW of Hylan Blvd. This is a great new purchase by the New York State DEC. Explore these beautiful woodlands' extensive American Beech, Oak and Sweet Gum forest with naturalist/photographer Sandra Mechanic. Meet at the corner of Bartow and Richard Avenue off Hylan Blvd. across from Mt. Loretto Unique Area. Bring bug spray and beverage. For more information contact Sandra at (718) 967-1037.
Who eats what and why depends largely on their serving utensil -- their beak! Greetings. This is the New York Rare Bird Alert for Saturday, July 17th 2010 at 1am. The highlights of today's tape are AMERICAN WHITE PELICAN, AMERICAN AVOCET, WHIMBREL, HUDSONIAN GODWIT, WILSON'S PHALAROPE, pelagic birding from land and shorebird migration. An AMERICAN WHITE PELICAN and 3 AMERICAN AVOCETS were reported on Wednesday at Jamaica Bay Wildlife Refuge the avocets on the West Pond and the pelican on the East Pond. 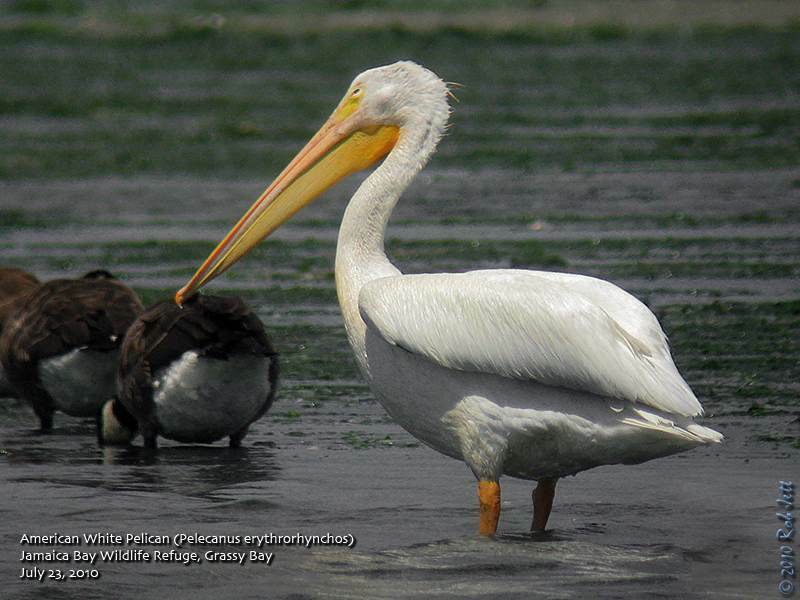 The pelican was still present on Friday. Three WHIMBREL were reported, 1 on Saturday and Sunday at the Cupsogue County Park flats and 1 at the Shinnecock mussel beds on Thursday and another at the East Pond Jamaica Bay on Friday. Two HUDSONIAN GODWITS were reported, 1 Saturday and Thursday on the Cupsogue County Park flats and another on the East Pond at Jamaica Bay on Thursday and a WILSON'S PHALAROPE was seen Friday at the East Pond Jamaica Bay and another at Cupsogue last Saturday. Pelagic birding from land last week produced the following results: on Saturday at Cupsogue County Park in Westhampton Dunes 6 CORY'S SHEARWATERS, 2 GREATER SHEARWATERS and 10 NORTHERN GANNETS, on Wednesday at the Shinnecock Inlet 12 CORY'S SHEARWATERS, 12 GREATER SHEARWATERS, 2 SOOTY SHEARWATERS, 8 WILSON'S STORM-PETRELS, on Thursday at the Shinnecock Inlet 70 CORY'S SHEARWATERS, 50 GREATER SHEARWATERS and 80 WILSON'S STORM-PETRELS, and on Friday from Pike's Beach in Westhampton Dunes 1 MANX SHEARWATER, 1 CORY'S SHEARWATER, 11 GREATER SHEARWATERS, 75 plus WILSON'S STORM-PETRELS, 2 BLACK TERNS and 4 NORTHERN GANNETS. Shorebird numbers continue to rise at the south shore locales at Pike's Beach, Cupsogue flats, Jamaica Bay. Despite extremely high water levels at the East Pond at Jamaica Bay 8 species of shorebirds were reported on Friday at the East Pond with over 800 SHORT-BILLED DOWITCHERS, a WHIMBREL, 2 WESTERN SANDPIPERS and about 10 species were reported during the week at Cupsogue and at the flats at Pike's Beach. Other interesting birds for the week were: a LEAST BITTERN on Friday at the East Pond Jamaica Bay, a GULL-BILLED TERN on Sunday at Jamaica Bay, a ROYAL TERN and an ARCTIC TERN at Cupsogue on Saturday, a 1st year LESSER BLACK-BACKED GULL at Mecox on Saturday, a 1st year BALD EAGLE at Montauk on Saturday and a LOUISIANA WATERTHRUSH at Central Park on Friday. Tom Burke will be away next week, please call in reports to Tony Lauro at (631) 734-4126. 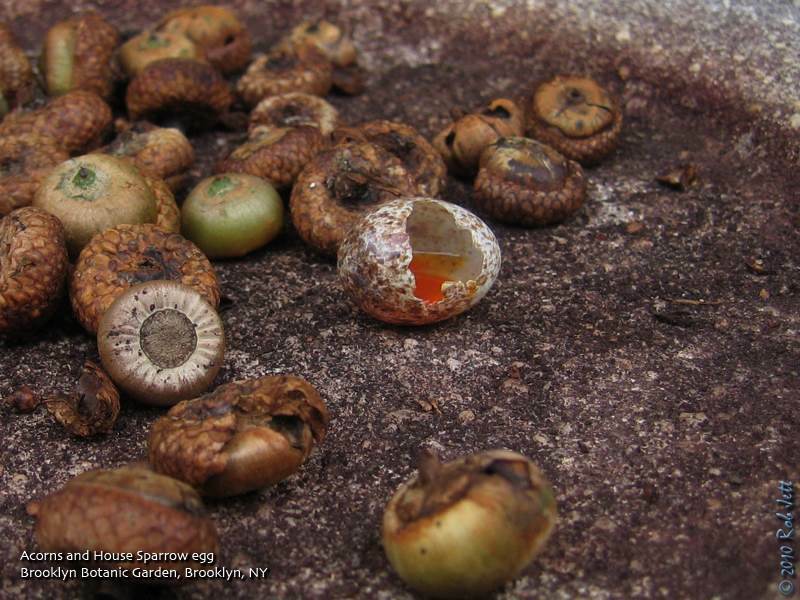 A collection of acorns on a decorative concrete bowl in the Brooklyn Botanic Garden also included a broken House Sparrow egg. Eastern Gray Squirrels (Sciurus carolinensis) are primarily vegans but may also eat bird eggs. Here's an interesting article on squirrels from the New York Times. When I first started birding, I found it curious that many birders stopped looking at birds in the summer and started looking at butterflies and dragonflies. I mean, there were still lots of breeding birds around, why shift one's focus? Well, I'm beginning to think that there is some kind of subliminal, mind-control program in place by the insect world, because I've suddenly become inexplicably fascinated by all things winged. Last weekend I decided to spend a few hours at the Brooklyn Botanic Garden, looking for butterflies. I had forgotten that the garden didn't open until 10am, so at 8:30am I was looking at a locked gate. Heydi and I decided the next best thing would be to cross Flatbush Avenue and explore Prospect Park for 90 minutes. There's a nice section of flowering plants behind the Boathouse, as well as, the meadows on top of Lookout Hill. The coneflowers, coreopsis, verbena and other plants near the Boathouse attracted bees, wasps and other pollinators, but not a lot of butterflies. There were mostly just a lot of Cabbage Whites. From that location we headed down the Lullwater, towards Breeze Hill, then Lookout Hill. Along the slow moving water of the Lullwater there were lots of Eastern Amberwing dragonflies. These tiny dragonflies are normally found close to water. 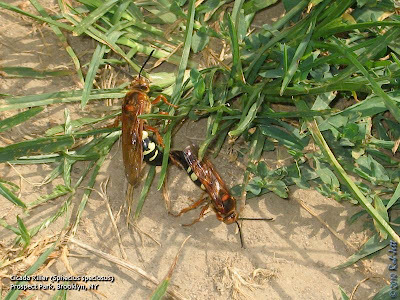 As we walked up the rise towards the Maryland Monument I mentioned that there was an annual Cicada Killer colony within the short grass along the hillside. Little piles of excavated dirt reveal their burrow's entrance and are a sure sign that these massive wasps have returned for the summer. I didn't noticed any dirt piles but we did see several males and females in courtship chases above the grass. 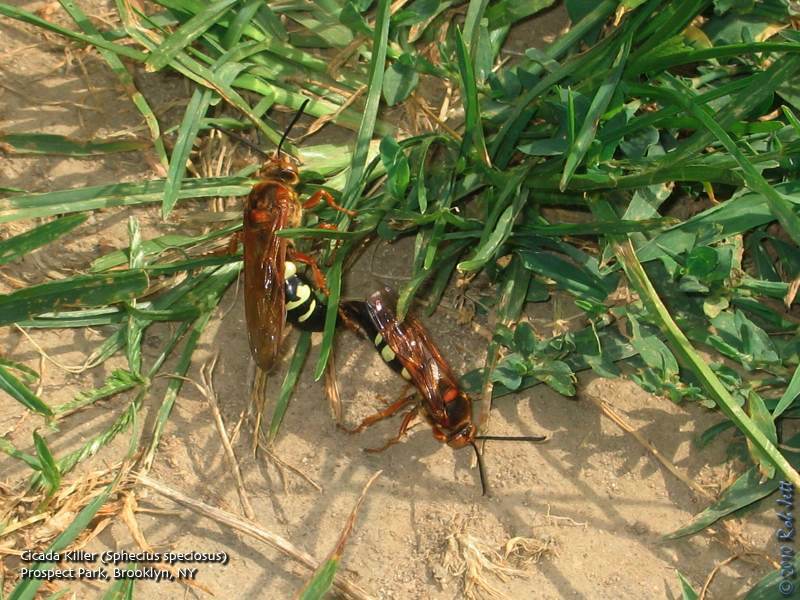 This pair in the photo were mating on the ground but did actually fly short distances while joined. They may look menacing, but are quite harmless to humans. The "Butterfly Meadow" on Lookout Hill wasn't very active so we walked the dirt path up to the small, weedy opening at the top of the hill. I was surprised to see that the overgrown area, which is usually just dominated by Canada Thistle, now had large sections of sunflowers. Both Jerusalem Artichokes (Helianthus tuberosus) and Cup Plants (Silphium perfoliatum) were being visited by Eastern Tiger Swallowtail, Summer Azure, Red Admiral and Monarch. There were also a couple of dozen Cabbage Whites feeding on the thistle flowers. We had started heading back towards the botanic garden when a black swallowtail-like butterfly circled over our heads. It landed very briefly near a butterfly bush, but long enough to get a photo and ID is as a Pipevine Swallowtail. 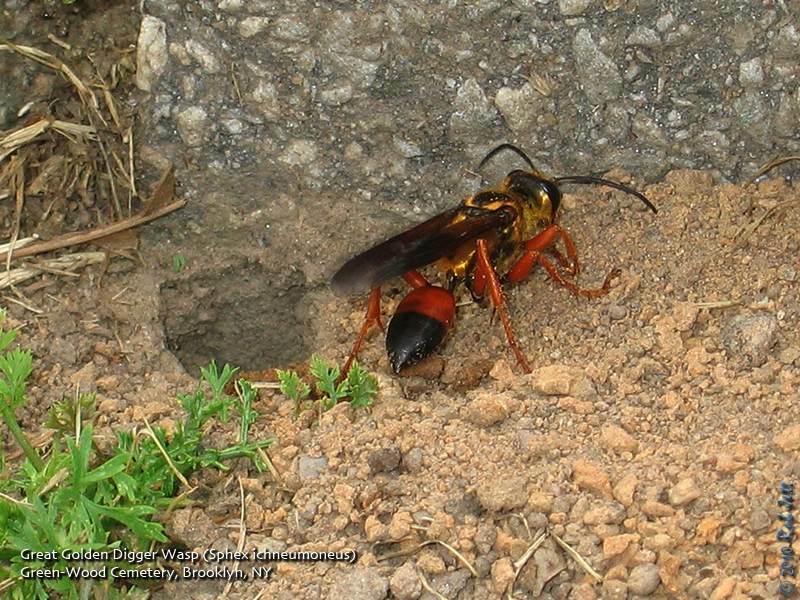 I'd never seen one of these beauties and they are, apparently, uncommon around NYC. 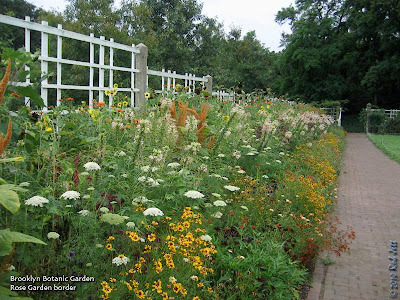 There are a few spots in the botanic garden that are good for butterflies - the wildflowers in the Children's Garden, a stand of Butterfly bushes just west of the Children's Garden, the Mixed Perennial Border at the Lily Pond, the Composite Family opposite the Rock Garden (lots of sunflowers) and the Native Flora Garden. I was surprised by one other, incredible addition, however. 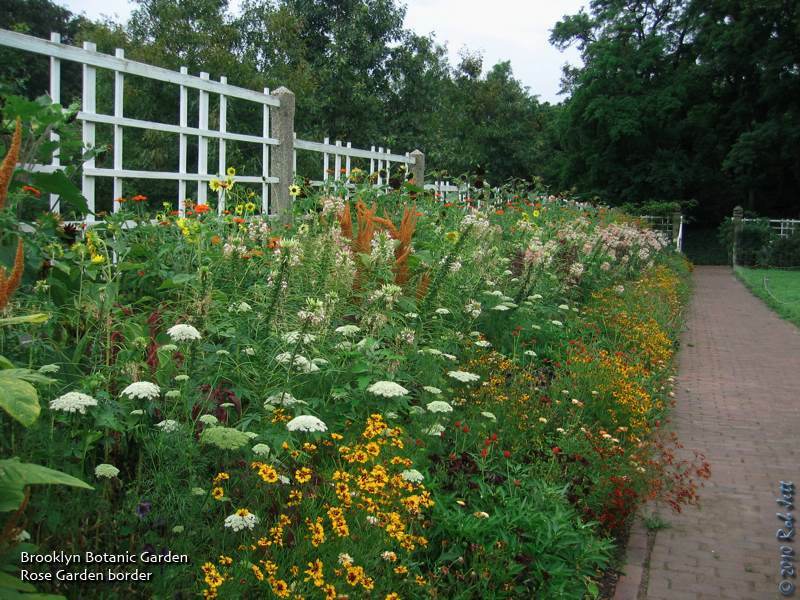 The borders at the south end of the Cranford Rose Garden has been replanted with an amazing mix of wildflowers. 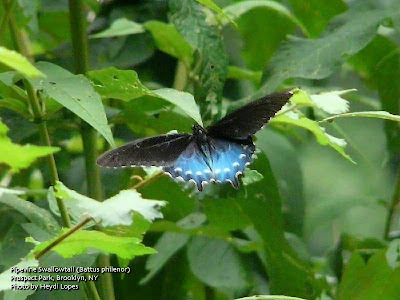 Here we spotted Eastern Tiger Swallowtail, Black Swallowtail, Pipevine Swallowtail, Cabbage White, Orange Sulphur, Coral Hairstreak, Gray Hairstreak, Summer Azure, Red Admiral, American Lady, Monarch, Silver-spotted Skipper, Dun Skipper and Sachem. There may have been others, I can't remember. Maybe Heydi can correct me in the comments section. I could have spent the rest of the afternoon combing through the wildflowers, but the sky was getting dark and I didn't feel like biking in a thunderstorm. Now that shorebirds and seabirds have begun moving through our area, I think this coming weekend I may shift gears and start paying more attention to the birds. Listen to National Public Radio's, Morning Edition -"Bug Highway In The Sky"
Friday, July 16, 8 p.m. to 10 p.m. The 250 acres of forested, freshwater wetlands that make up Blue Heron Park hosts a collection of nocturnal critters. Join Cliff Hagen as he walks the back trails of Blue Heron to seek out the bats, birds and bugs that inhabit the park at dark. Dress against mosquitoes and bring a light to use sparingly. Sugaring for moths will take place as well so you can share some fruit juice if you wish. Meet at the parking lot on Poillon Ave, between Hylan Blvd. and Amboy Road. Saturday, July 17, 8 a.m. to 10 a.m. The Greenbelt is home to dozens of species of nesting birds and there is no better section of woodland to search for and identify our feathered friends than in Buck’s Hollow. In years past Howie Fisher has confirmed rare birds fledging young in the area and with any luck this summer’s search will prove fruitful as well. Meet at the intersection of Manor Road and Rockland Avenue, near the wide entry road to Eger Home up the hill. Saturday, July 17, 10 a.m. to 2 p.m.
Meet in the Nevada Avenue parking lot at High Rock. If you come late, walk to the first bend of the entry road and follow the Yellow Trail to the Green Trail and on to our working location where we will be removing invasive vines from shrubs and saplings. If you don't have your own, Protectors will supply gloves and pruners (& refreshments). After a two hour work session (our 169th consecutive monthly workshop), we will take a short walk along nearby trails. What are invasive plants and why should we remove them? Get your hands dirty as we learn about the threat posed to our native flora by foreign invaders from a professional Parks Dept. ecologist. Gloves, bags and light refreshments provided. Meet in front of the Visitor's Center at Hylan Blvd. and Satterlee St.
Stroll through our beautiful park as you learn about its wide variety of trees. From the rocky shore to the forest, this island has it all. See it for yourself! Enjoy the dramatic views of the Palisades and Hudson River from this quaint park in the Bronx. Be an animal detective as we follow the tracks of the animals that live in Marine Park. Find out how much life there is in that "dead" log on the side of the trail. Greetings. This is the New York Rare Bird Alert for Friday, July 9th, at 9:00 pm. The highlights of today's tape are MANX SHEARWATER, CORY'S SHEARWATER, WHIMBREL, GULL-BILLED TERN, ROYAL TERN, and migrating shorebirds. A sea watch off Robert Moses State Park parking field 2 early last Saturday morning featured a MANX SHEARWATER patrolling offshore for half an hour or more before moving west. Among a small assortment of shorebirds migrating by were two WHIMBREL, this all on northwest winds. By Monday the winds had shifted to a southerly component, producing a flight of CORY'S SHEARWATERS with about 14 seen off Moses field 2, virtually all before 8:30am. At Jamaica Bay Wildlife Refuge the water level on the East Pond remains much too high for shorebirds, but unfortunately attractive to Mute Swans. Most of the southbound shorebirds have been appearing on the south shore of the West Pond, these recently including LESSER YELLOWLEGS and GREATER YELLOWLEGS, LEAST SANDPIPER, and SHORT-BILLED DOWITCHER. Terns around the West Pond have featured a GULL-BILLED TERN or two, often over the South Marsh, and an increasing number of BLACK SKIMMERS. Continuing herons included TRICOLORED HERON, LITTLE BLUE HERON, YELLOW-CROWNED NIGHT-HERON, while among the ducks have been a few WOOD DUCKS, GREEN-WINGED TEAL, and a lingering GREATER SCAUP. If you visit the Bay, please stop by the Visitors Center and remind them of what a valuable resource the drawn down East Pond is to the migrating shorebirds. A BLACKPOLL WARBLER was still singing in Bryant Park in midtown Manhattan this morning, perhaps mistaking the surrounding buildings for a montane habitat. In Roslyn up to six COMMON RAVENS including recent fledglings are still being seen around the tower adjacent to the Nassau County Art Museum. 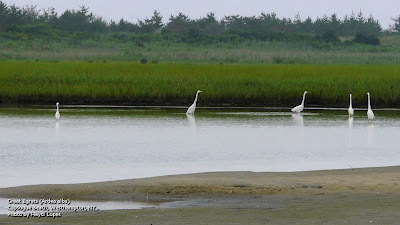 Out at Cupsogue County Park in West Hampton Dunes, no exotic terns have been seen recently on the flats, but there were two ROYAL TERNS last Monday with five ROSEATE TERNS also there. Like the numbers of Common and Least Terns, the numbers of migrant shorebirds have also been increasing there, including up to four WESTERN WILLETS on Sunday. Other arrivals included a peak of 60 LEAST SANDPIPERS Sunday, five SANDERLINGS Saturday, and numbers of SHORT-BILLED DOWITCHERS and LESSER YELLOWLEGS. Two WHITE-RUMPED SANDPIPERS have also been lingering there. Among some interesting regionally breeding land birds were two HERMIT THRUSHES singing in Hunter's Garden off Route 51 in Eastport Saturday. Remember to maintain a zero disturbance approach when visiting the nesting areas of sensitive species. It means a lot to them. For the next two weeks Tony Lauro will be handling the Rare Bird Alert, so please call Tony with your reports at (631) 734-4126. 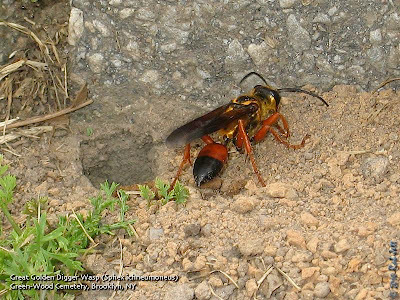 The Great Golden Digger Wasp may look frightening, but are relatively docile (unless handled). This impressive individual was found digging a tunnel for laying its eggs near the base of the Civil War Soldiers' Monument in Green-Wood Cemetery. The plantings at this locations offer an abundance of nectar for the adult wasps. Join Sandra Mechanic in her annual count of the specimens of the rare Staten Island Ragged Fringed Orchid that have been seen there for the last few years. Mowing equipment may have disturbed the orchid site but we hope the plants rebound and continue multiplying in the two areas we have found them. We are interested in seeing if they propagate themselves in the southern section of the park where we have not yet seen them. For more information, contact Sandra at (718) 967-1037. Saturday, July 10, 2010, 12 noon to 2 p.m.
Past and present blend in the Conference House Park where history stretches back thousands of years with seasonal occupation of the Lenape and hundreds of years with the inhabitation of the Dutch and English. In addition to the local history we’ll observe the geology of the area and look for what the debris at the high tide line has to reveal. As the tide goes out we’ll move into the intertidal zone to find out what sort of living things survive in this challenging environment. It’s going to be muddy so dress appropriately. Meet at the parking lot at the end of Hylan Blvd. on the left. Find out why Protectors urged the preservation of this parkland and how we got our name in 1975. It has rare Southern pine and oak trees, nothing like our Greenbelt forest. With a park permit, Sandra will lead the group into the restricted area where few have trod. We will check in the sand or mud for deer prints throughout the park. We'll find the diseased clones of the American Chestnut that has produced flowers and fruit the past few years and the unhealthy 7 to 8 inch diameter chestnut trees, now 20+ feet tall and 9 to 10 inches in diameter and diseased. The trunk-splitting at the base is indicative of chestnut blight. Meet at the old park office building at the end of Carlin Avenue, off Sharrotts Road in Rossville. Wear waterproof shoes. Call Sandra at (718) 967-1037. 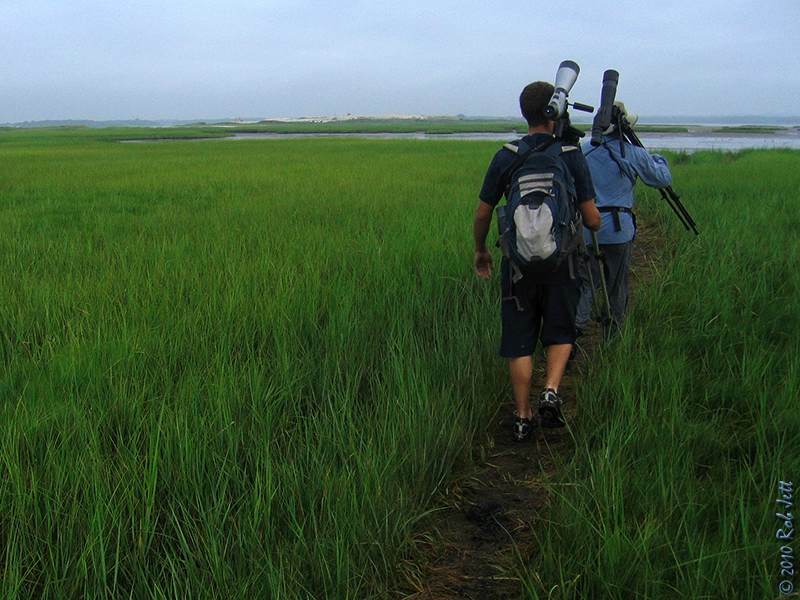 Join us for a weekly Ranger-led birding walk of the Salt Marsh Nature Trail. Space is limited. First-come, first-served. Ages 8 and up. Check on flowers that thrive in the summer swelter. 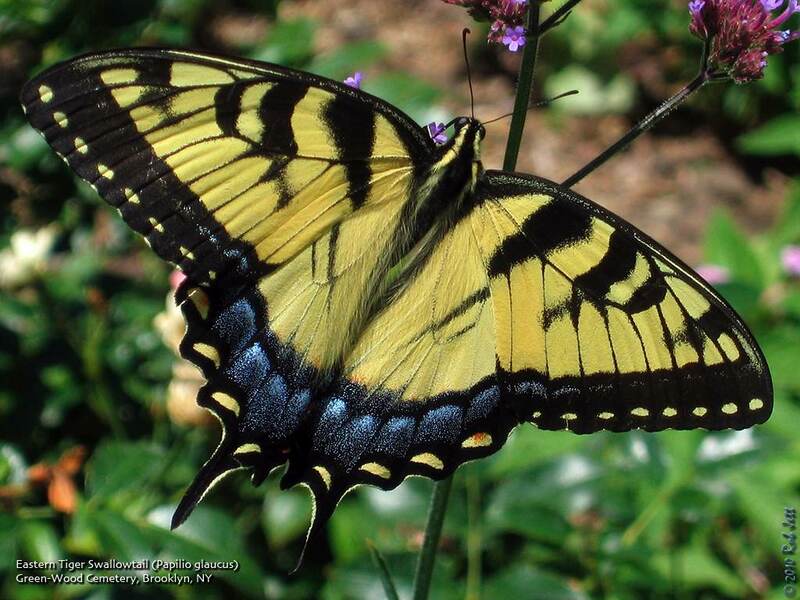 I found this beautifully fresh Eastern Tiger Swallowtail feeding on Verbena near the entrance of Green-Wood Cemetery. Unlike the month of May, when uncountable numbers of birds stream through the city on their journey north, June is characterized more by local nesting activity. However, I did manage to add a few more species to my year list. 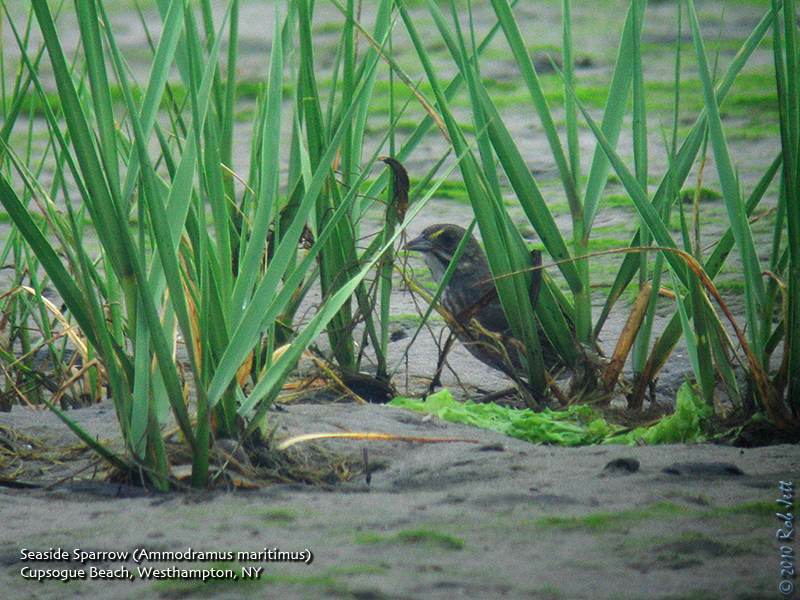 Early in the month migrating shorebirds can still be found along New York City's coastal habitats. During the month's first weekend, tide, moon phase and weather were in perfect alignment, and I was lucky enough to observe large numbers of sandpipers feeding on horseshoe crab eggs at Plum Beach. I ended up adding 4 more species to my Brooklyn year list at that location. At 215, I am now just 5 species away from last year's end-of-year total. Over the last weekend of the month I spotted a Roseate Tern in Queens, bringing my year total for New York State to 227 226. By the end of July there should be many more shorebirds to sort through as adult birds begin heading south after their very brief breeding season. Red-tailed Hawks, whether hatched in a true wild environment or within an urban jungle, face many survival challenges within the first few weeks of fledging. They say that the first year is the most critical for a young raptor, but around New York City, it is sometimes just a matter of luck if a young hawk makes it passed the first month's gauntlet of metropolitan hazards. 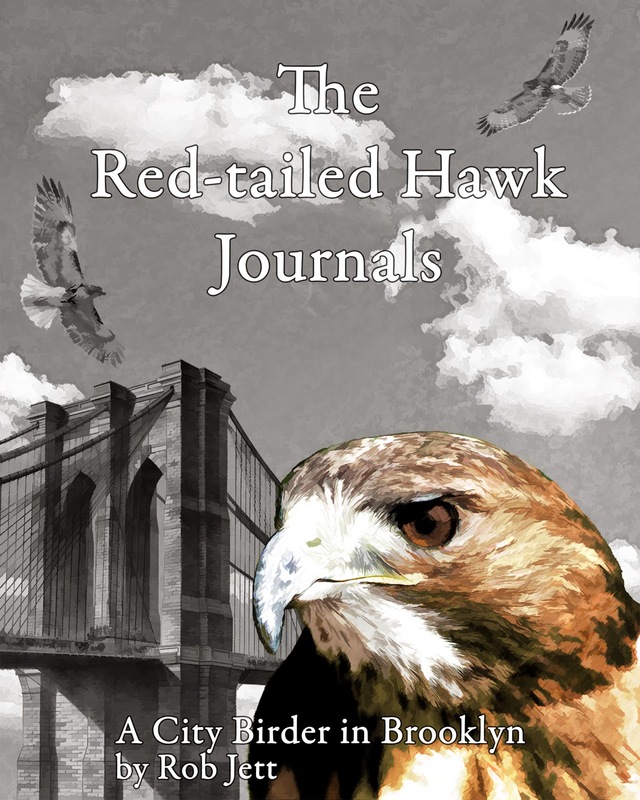 This is a story about two young Red-tailed Hawk's whose young lives took very different turns, yet are now tied together, through luck and the kindness of others. Today we got in a fledgling from the Bronx that was caught on barbed wire on top of a fence and has a wing injury now. 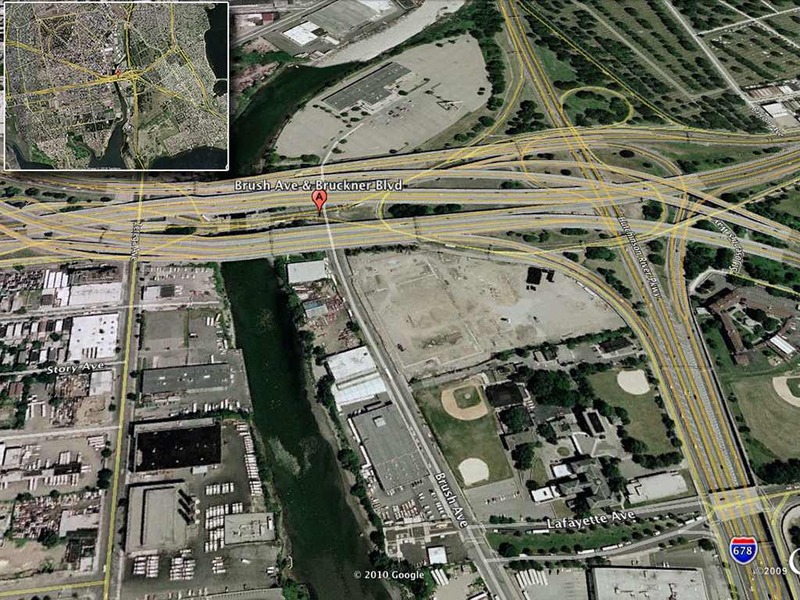 It was located at the vicinity of Bruckner Blvd. and Brush Ave. There must be a nest nearby. When I received the note, I immediately searched for the location on Google Earth. 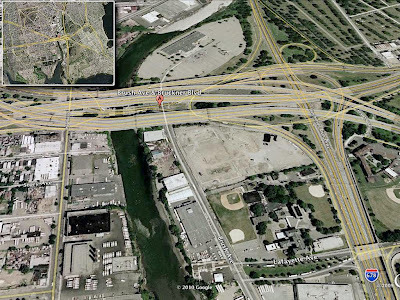 What I found was a heavily industrialized area crisscrossed with highways at the edge of the Bronx River. There were a couple of baseball fields nearby, as well as, a small cemetery. It didn't seem like a very good spot for nesting Red-tailed Hawks. I knew that the young hawk was in good hands with Bobby and Cathy, so didn't give it much thought until I received a call from Bobby this past weekend. Bobby called to tell me that the Bronx hawk had healed nicely and was ready to be released. The only problem was that they were unable to locate the nest or any other hawks near the spot where the small male hawk was found. He explained to me that, in his experience, adult Red-tailed Hawks will readily accept and feed an orphaned fledgling crying for food. Bobby didn't want to overburden parents with three offspring, but any with one or two would be alright. I suggested Big Mama and Junior, in Green-Wood Cemetery, for a couple of reasons. There were only two fledglings to feed, plus, Junior has always been an amazing provider, often bringing more food than his offspring could possibly eat. He agreed that the cemetery family would be a good fit, so I called Marge to arrange approval with Green-Wood's management. 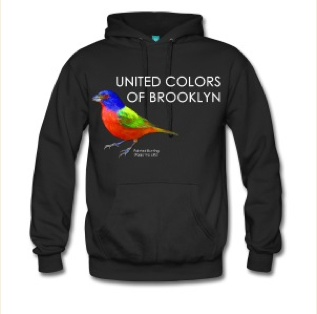 It seemed that all was happy and tranquil within the Brooklyn hawk kingdom...until Monday. I received a call from Marge. She was very upset. 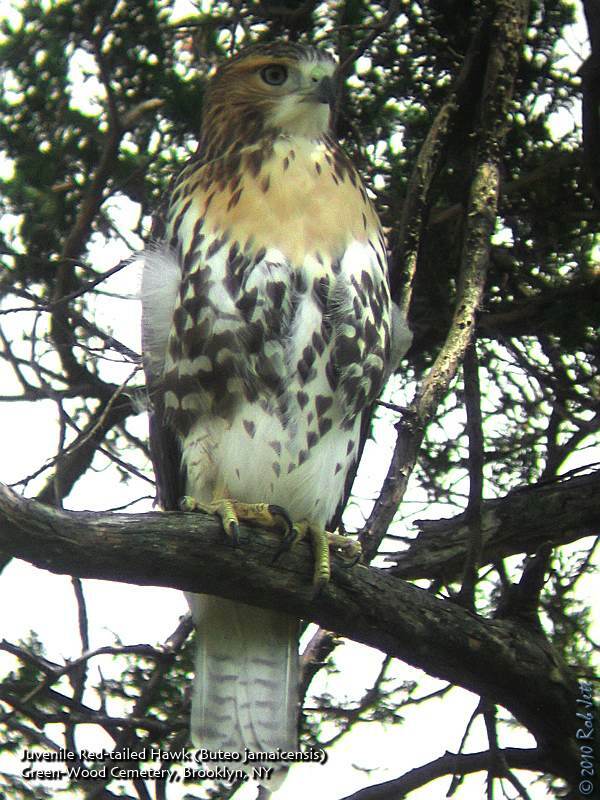 A security officer in Green-Wood Cemetery found one of the fledgling red-tails dead. It was near the side of the roadway, beneath the large spruce tree where they liked to perch. It was impossible to tell visually what had killed the young raptor. The 90+ degree temperatures had caused the carcass to rapidly decompose. I spoke with Tommy, one of the security guards (and a huge fan of the hawks) who told me he had patrolled the area the previous night and that he hadn't seen the hawk. It expired in a spot that would have made it hard to miss, especially by someone who is attuned to their habits. There are lots of things that could have killed it. One fairly common illness is frounce, which they can get from eating an infected songbird. 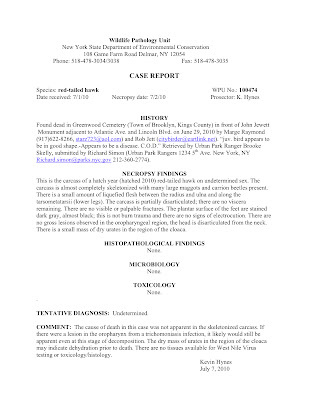 Marge contacted the Urban Park Rangers, who picked up the carcass to send to the NYS Wildlife Pathologist. Ward Stone will determine the cause of death and I'll eventually post that info here. In the meantime, Bobby still planned on releasing the Bronx fledgling in Green-Wood. So little time had passed since the cemetery hawk died that, perhaps, Big Mama and Junior never missed him and would immediately accept the new one. We arranged to meet at the entrance to the cemetery yesterday afternoon and then drive to the area beneath the nest where the fledglings had been hanging around (and begging for food). Tommy came along with us and we all walked the area in the shadow of the towering Littleleaf Linden tree looking for the surviving fledgling. It only took a couple of minutes to locate her perched in a favorite cedar tree near the edge of Linden Avenue. She then commencing crying and flying around hoping her parents would show up with some food. Yesterday was Bobby's son, Chris', birthday. In celebration, Chris was given the honor of releasing the hawk. We walked up the side of "The Hill of Graves" towards the large London Planetree where the larger, female fledgling had flown. After a minute or two, Chris released his hawk and it flew into a linden tree at the top of the hill. A moment later, the female (his new adopted sister) flew across the hill and perched in the tree a couple of feet above the male. They checked each other out for a few minutes, before the female decided he was cool, then she went back to the cedar tree and continued squealing for food. Before we left, she had rejoined her new brother from the Bronx and the two sat side by side waiting for one of the adults to deliver dinner. In addition to the Red-tailed Hawk fledgling, Bobby also had a few other, tiny passengers in his car. 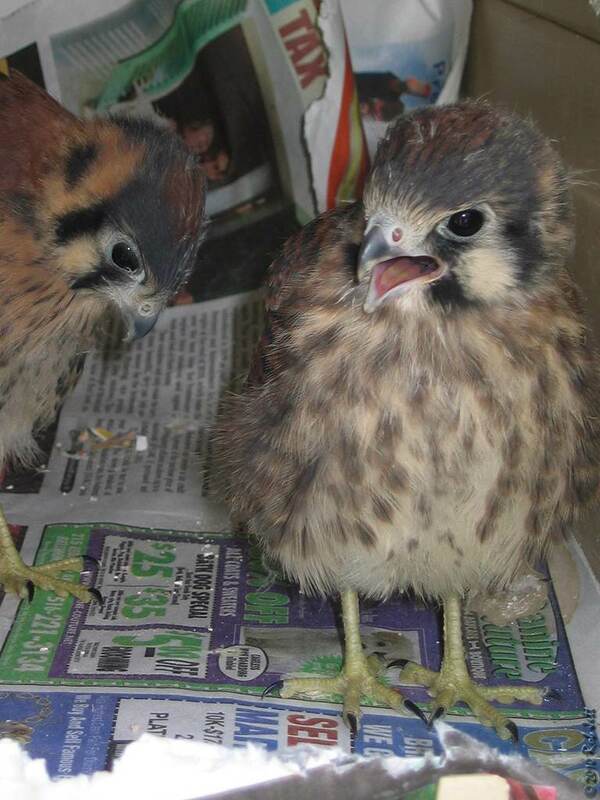 On his way to Brooklyn, he had to stop somewhere else and pick up three American Kestrel chicks. At this time of year, the young falcon will sometime leave the nest (or fall out) before they are ready. In the wild, it might not be such a huge problem, but around NYC they end up near busy streets or sidewalks. Fortunately, there are many caring people around who will pick them up and call a wildlife rehabilitator. The three chicks in Bobby's car needed about another 10 days of feather growth and fattening up before they could be released and fend for themselves. One was so hungry that he kept trying to eat the newspaper at the base of the carrier. Another would nibble on Bobby's finger if it came within reach. Bobby was planning to stop at a grocery store on the way home to pick up some steak to cut up and feed to the hungry little things. I'll keep you posted about their release in Brooklyn.